OS grid reference: SU 2738 7159. Holy Cross Church is located near the high street in the centre of the village of Ramsbury – off the A419 Hungerford to Swinden road, halfway between Marlborough and Hungerford – on the north bank of the river Kennet. Hungerford is 4 miles to the south-east, while Marlborough is 4 miles to the south-west. The 13th-14th century limestone church stands on the site of an Anglo-Saxon settlement from around 900 AD at which time, or later, the first church was given “minster” status and a bishopric created in 909 AD. Housed in the church are parts of two Saxon preaching crosses, two Saxon coffin lids and some other, later, medieval stones. At the western end of the north aisle there are several Anglo-Saxon and medieval artefacts. Three large stone fragments make up part of a 9th-11th century cross-shaft that is locally referred to as ‘the great cross of Ramsbury’. These ancient fragments have now been reconstructed as best as can be. On the front face is a rather “friendly” looking serpent that is coiled-up in a lengthwise position and, strangely enough, it appears to be biting its own body, whilst in between and around it there is some very nice interlacing in the form of long, interweaving plant stems or tendrils. 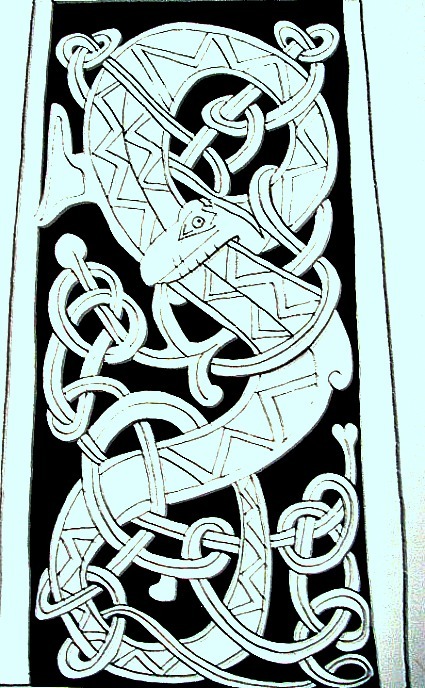 This is said to be of Anglo/Danish origins and of the Ringerike-style of carving, something that was popular in Wessex at this particular time in history. The sides and the top section of the cross have knot-work and circles or wheels. On the opposite side there is more interlacing and another creature. And there are some fragments of a second Anglo-Saxon cross-shaft. These artefacts were discovered built into the south wall during restoration to the church back in 1891. There are also two rather fine “coped” coffin lids from the 9th-10th century AD, one of which has a carving of a bishop, the other shows foliation in the form of scrolls and pointed stems or barbs. This style of workmanship is thought to be similar to that often seen on hog-back tombs from the north of England, and again of Danish/Viking origins. Also, part of a medieval stone-slab with a stepped cross (in relief) and other cross fragment from the 13th century. Categories: Ancient Churches / Chapels, Saxon Crosses | Tags: Holy Cross Church at Ramsbury in Wiltshire | Permalink.